As we all know, a busy retail facility is a haven for dirty surfaces, especially concrete. The foot traffic, chewing gum and drink spills take their toll on an otherwise inviting entry way to a business. When the time comes that the dirt is just too much, many companies will utilize employees to perform pressure washing tasks. It makes sense in some aspects, it’s almost always less expensive and it saves the hassle of dealing with an outside vendor. Take a look below at 3 reasons why in-house pressure washing could cost you more. 1. It takes longer– The proper tools for the job are essential. 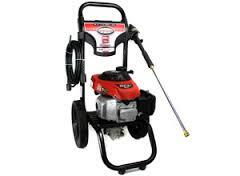 Small, cold water pressure washers (which most businesses will use) are no match for professional grade equipment. For example, if it took an employee 3 hours to clean a sidewalk with a typical box store pressure washer, a cleaning contractor could clean the same sidewalk 10-20 times faster using a high volume hot water unit with a surface cleaner attachment. after calculating the company’s expenses for the employee cleaning (payroll, fuel, water usage, equipment), one might find that using employees is not as cost-effective as they thought. To take it a step further, the results of the cleaning are not so great. Most of the stains and chewing gum are still there due to the limitations of in-house equipment. 2. 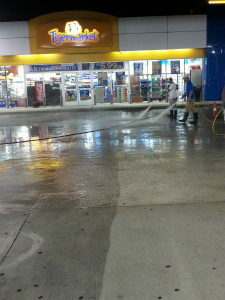 Liability– The list of things that can go wrong while pressure washing is too big to comprise. The most common issues are injury, property damage and environmental fines. 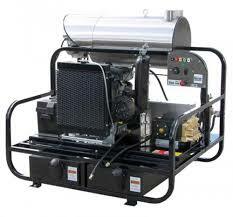 The spray from a pressure washer can cut through clothing and remove skin, debris can be blow into eyes. Falls are a common occurrence due to wet surfaces and tangled hoses. Untrained persons using pressure washers could easily apply too much pressure and etch concrete, remove paint or use chemicals inappropriately. All of this can lead to costly repairs to the property. The EPA guidelines regarding wash water run off are being enforced more and more, and the fines for letting run off water go into storm drains can be astronomical. A seasoned pressure washing company knows and abides by these guidelines in order to keep pollution out of our waterways and avoid fines from municipalities. 3. Results. It is more cost-effective to do something right the first time than to do it twice. The difference in a professional cleaning using hot water and the proper detergents and an employee using sub par equipment will be night and day. If Money is spent on in-house pressure washing, there is a good chance the results will not be satisfactory and subsequent cleanings will be needed. Click here to learn more about hot water pressure washing.